Copenhagen-based investment bank, broker, and software developer Saxo Bank has unveiled what it describes as a ‘groundbreaking’ new social trading platform – Tradingfloor.com. The site is now live in beta form at beta.tradingfloor.com. 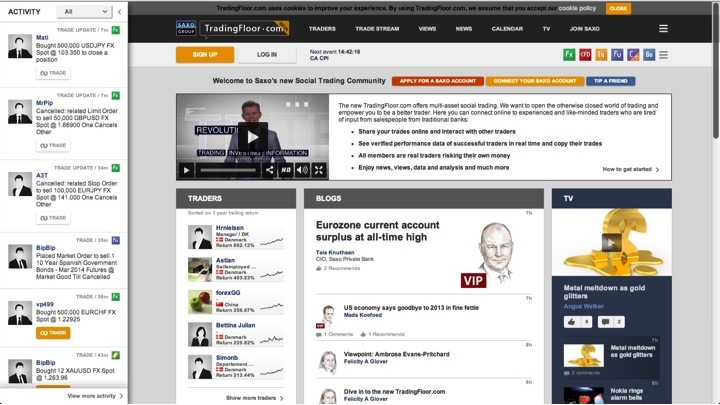 Tradingfloor.com was originally created by Dinis Guarda, founder of Traders DNA.com and IntelligentHQ com, as a platform for sharing the expertise of some of Saxo’s top analysts, economists, and traders. With the roll-out of the new portal, it has evolved into a fully integrated, multi-asset social trading portal – the first of its kind. It enables traders around the world to share their trades with others on the site, transforming trading into a social experience. “We want to set free the peer-to-peer power of traders around the globe by enabling them to connect online with experienced and like-minded investors who are tired of input from salespeople from traditional banks,” Saxo Bank co-founders and co-CEOs Kim Fournais and Lars Seier Christensen said in a joint statement. The new version of the site enables investors to share their trades with the community, with verified performance data so that investors can make informed choices about who to follow or copy. While there are a few social and copy trading networks out there already, Tradingfloor is the first to offer multi-asset trading in this way. “Having once revolutionised online trading as a first mover in 1998, we now want to democratise the access to trading and fund management by opening up an otherwise closed world of trading. We now enable investors to share their trades openly, interact with each other, post comments and strategies, discuss, follow and copy each other. We believe that this may change radically how investors will go about trading FX, CFDs, options, futures, bonds and equities in the future, making trading a social experience,” they said. The new portal has been under development for the past 12-15 months, although the owners first discussed the idea more than two years ago. As well as being the first social trading portal to offer trading across a variety of asset classes, it is also the first community of its kind to feature only ‘real’ traders, as opposed to those using demo accounts, and provide their full trading history and performance. The insistence on full transparency is something that Saxo feels won’t put off traders, especially as they can still have a degree of anonymity by using a nickname or handle instead of their real names. 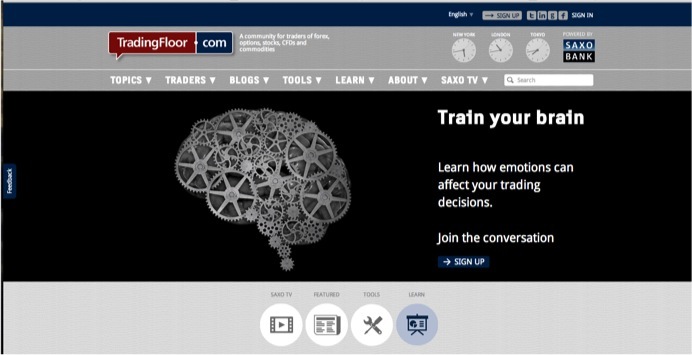 Over the past 12 months, Saxo has been cultivating a network of traders who have been using the system as it goes through the development process. By focusing the development process on the end user, Saxo feels they can create a system that is more intuitive and user-friendly for the end user. In fact, this is also the rationale behind launching in beta, to allow users to help define the development of the platform and to make this process transparent, in keeping with the ethos of the project. The new Tradingfloor.com brings with it all the valuable content from the previous incarnation of the website, including market news and views, data, insights and trade ideas from top economists, researchers, and analysts at the bank. It will also have a real-time trade stream to help you to gauge market sentiment, and it will also feature an on-demand TV channel hosted by former Bloomberg and BBC World anchor Owen Thomas and award-winning ITV News correspondent Angus Walker, where they will be reporting from the trading floor at Saxo Bank.